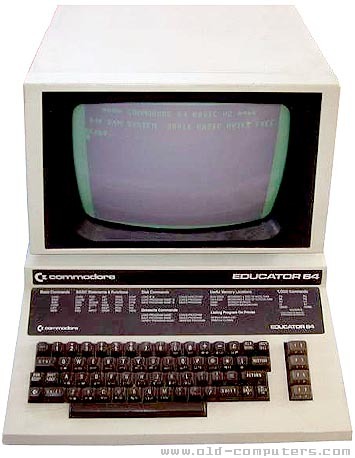 The Educator 64, also called CBM 4064 and PET 64 was the Commodore's second attempt to sell a C64 based system to U.S. schools and so compete with the Apple II. Like Apple, Commodore could take advantage of a large range of available public domain educational software. The first attempt came in the form of a basic C64 case. But the system was so often stolen that the department of education suggested Commodore provide a new system including the computer and the display in the same case. Since the resulting system was to remain inexpensive, Commodore brought back to life old PET 4000 cases with monochrome monitors and fitted them with refurbished C64 motherboards. Some models came with a modified kernel ROM which inhibited colors and sound, and displayed a different start-up message. Others featured an internal audio amplifier and headphone jack. The Educator 64 keyboard color code was also removed from the front of the number keys. Although the last version was sold with a color display, the Educator 64 never was sold in big quantities. It's now a piece of choice for computer collectors. I/O PORTS 2 x Joystick plugs, Cardridge slot, Tape interfarce (300 bps), Serial, User Port, TV RF output, headphone jack. see more Commodore Educator 64 Ebay auctions !